I just wanted to let all of you Numerology and ambient music fans know about an event I'm organizing for next year. 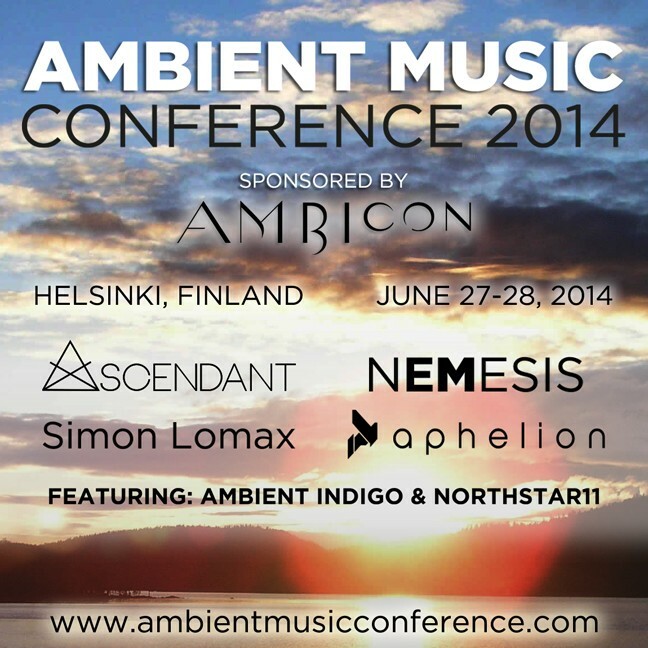 The Ambient Music Conference 2014 is going to showcase some of the best new talent in the ambient scene today. Our venue is spectacular as well which is going to make for an unforgettable weekend! My own band Ascendant comprised of myself (S1gns Of L1fe) and Don Tyler (Phase47) are going to be performing live. I will definitely be using Numerology in a live scenario so for any of you, that would definitely be something you'd want to check out! Hope some of you can make it. Spread the word and see you in Helsinki in 2014! It all started with a vision. When destination management expert and ambient producer Steve Hart (Ambient Indigo) first set eyes into the main conference room at the brand new Haltia Nature Center outside of Helsinki Finland, he had a vision. Outside the main window lies the pine forest. Beautifully preserved and perfectly appreciated from this new vantage point. It was there he thought of the music of Bay Area ambient musician S1gns Of L1fe and the cover of his latest release "Branches in the Sky" that inspiration had struck. His music, this venue, the backdrop, it all seemed too perfect. And it was. The Ambient Music Conference was born. Bringing some of the best new names in ambient music together in one place from North America and Europe, The Ambient Music Conference 2014 is poised to be one of the premier ambient events worldwide. This event is sponsored by AMBIcon, the event series formed by Hearts Of Space creator Stephen Hill. More than just a concert, The Ambient Music Conference 2014 will be a total ambient music immersion, a chance to hear great ambient music, and a fantastic opportunity to meet and network with fellow enthusiasts. We have brought together some of the best up-and-coming international ambient talents, along with established local names, in an amazing venue. Located in the heart of Finland's spectacular forests and lakes, part of the front wall of the auditorium can be opened up to give a view of the stunning scenery beyond, providing a gorgeous backdrop for musical performance. The event kicks off with a Networking Dinner on Friday evening followed by a unique night of "dark ambient"with the Finns featuring some of the best local talent in Finland. On Saturday, in addition to live performers, the main conference day will present educational sessions, specially-commissioned music for video and a live web cast and a chance for participants to get involved and have their own music featured in between each live performance. Our performers include the legendary Finnish ambient electronic band Nemesis, and a much-anticipated debut European performance from Ascendant, joining us all the way from California. This ambient duo comprises Chris Bryant, well-known in the ambient world from his solo releases as S1gns of L1fe, along with grammy-nominated mastering engineer Don Tyler, aka Phase47. Also scheduled to perform is Simon Lomax, formally going under the moniker "Maitreya" who is going to provide a magical display of deep ambience and blissful soundscapes. Finally, we have Dutch artist Aphelion bringing live instrumentation and sonic manipulation to the live stage. If you are an ambient music composer or enthusiast, this event offers an amazing chance to network with like-minded people, learn something new, have your own music heard in our pre-concert mix, hear some of the best live ambient music around, and generally have an unforgettable Helsinki City Break experience. Last edited by S1gnsOfL1fe; 10-10-2013 at 11:01 PM.